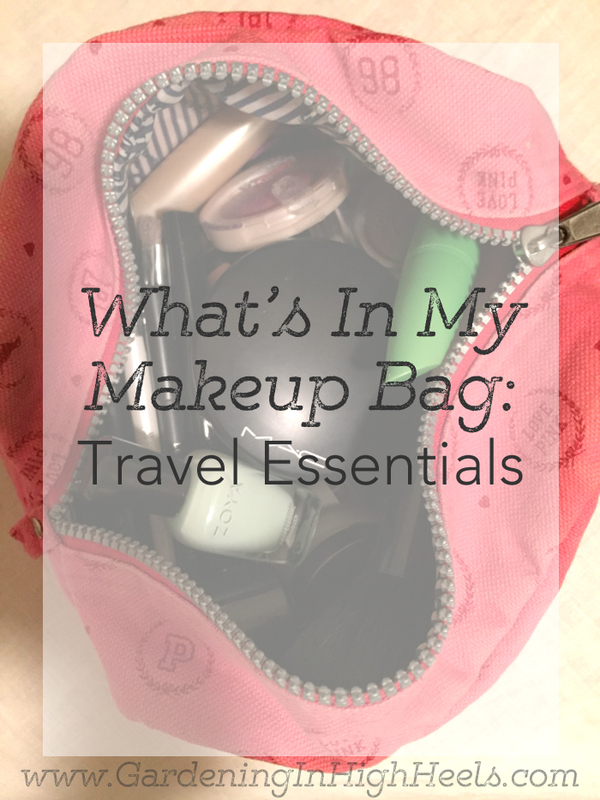 It’s no surprise that I’m excited for today’s Blogger, May I prompt, makeup essentials. I can always write about my makeup musts. I have tons of thoughts on makeup. I think it comes from my mom selling Mary Kay when I was young. I loved looking in her sample kit the pretty tubes full of fun things that I’d get to play with when I was older. I still do it today. I had a field day when she was cleaning out her old things before she moved. My makeup bag is scaled down right now (from my massive organization undertaking to just one small bag) for vacation. For Blogger, May I, I’m sharing my makeup essentials that are so necessary, they come on vacation with me. I try not to wear too much stuff on my skin so I can let it breathe, so what I use as my primer has to really have some staying power, blur some imperfections, and have sun protectant. I just finished a sample of Hourglass Veil Mineral Primer, so with me this time is Benefit’s The Porefessional. I also use primer on my eye lids and under my eyes to hold everything in place there. You never know how much sleep you’ll really get or if you’ll be puffy from sitting in a car for hours (maybe that’s just me). I like using an eye brightener under my concealer to fake the illusion of a restful vacation. I just got back into using Benefit’s Eye Bright, a crayon-like pinky hued pencil that perks up even the darkest of circles. I wish I could say that I have things that do double duty, like eye shadow that also doubles as highlighter, a bronzer, and fold-out couch, but I rarely use multi-use products like that. Instead, I look for small versions of what I love. I love slim shadow palettes for variety and portability. Wet n Wild has some great 8-pan palettes that are slim, great quality, and offer lots of eye-look options. On a normal day, I don’t bring makeup to the office to do touch ups, so you know I’m not wandering around the streets on vacation with a mini-makeup aresenal in my purse. I need all the room I can get for granola bars. I get hranky (that’s a step up from hangry; it’s hungry + angry + cranky). So I need to be able to put my eyeliner and mascara on once and let it be. Okay, here’s where I do a little double-duty with my makeup. I love lipsticks that are moisturizing or in some way offer a little extra comfort on the lips. I also want things that are easy to apply and aren’t sticky. There’s nothing like getting a cooling breeze and then having half your hair stick to your mouth. The lip products that I have with me can be applied with or without a mirror. Bite BB for Lips, Mary Kay True Dimensions lipstick, and Almay Smart Shade Butter Kiss lipstick all came with me. I have a few different color options for different looks and they’re all low-fuss. Of course, I have things like brushes and tweezers. And Jonathan would be so proud because I finally remembered to bring Band-Aids with me. I swear, I’m the least-prepared girl.